I love Lawson Crouse too. He is a power forward who performs all the little chores that a coach dreams about. However, Lawson has yet to show he is going to put much offense up on the board. Yes, I love Lawson Crouse and would be prepared to pay in the high teens for him but for me four is a little too much of a stretch for my pocket book. Incredible energy, skill & depth at WJC – 7GP 1G 2A 3PTS. Elite power game upside. Jakub is a player who has a lot of potential. He is a good on both offense and defense, provides decent size at 6’2, 185, has good mobility and a hard shot from the point. Jakub is a player that I would want on my team and is definitely worthy of a first round selection. However, he does not provide the high-end offense that you would normally expect of someone drafted in the 12th slot. Yes, I was surprised (in a good way) that Central Scouting had Timo at 13th where I had him. I was surprised because no other ranking else had him near as high and most had seemed to miss (and I am included in that bunch) the upgrade in Timo’s play from a good second rounder with a straight forward North-South to a high-end achiever who constantly delivers the works like your pizza delivery guy. Only in Timo’s case, the works include North-South, corners, boards, to the net, vision, passing, shot, creativity, results. After his performance in the CHL Top Prospects Game, I am beginning to wonder if we still have underrated Mr. Timo Meier. Filip is a prospect that I have never really warmed up to even though I have viewed him countless times (Charlottetown is the nearest QMJHL team to my house). Maybe it is his skating which is okay but not high-end or maybe it is because his frequent linemate, Daniel Sprong, still hasn’t got the team concept yet. Filip is a good prospect, a pass first type of guy who sees the ice well and creates opportunities for his linemates. Filip is a solid second round pick but so far has not exhibited the high end skills expected of someone to be picked in round one. Here is an interview that he had with John Moore to start the season. Nicolas Roy, yes, he looked like he could be a first rounder at the Ivan Hlinka tournament, yes, he is 6’4, 202 and yes, he has been playing better of late. However, he had a disastrous start to the season and looked out of place in the QMJHL. Even now, with his improved results, Nicolas appears, at times, bewildered out there. Even with his size I would find it difficult to use a first round draft choice on him as he has a high potential for bust. I am not supposed to like Travis (Chris, the editor has an admitted affinity for the smaller, smart, skilled players) because he is a small player (5’10, 171) but I love Konecny’s game. If you saw his player of the game performance at the recent CHL Top Prospects Game, then you had a glimpse of what makes Travis a special player. 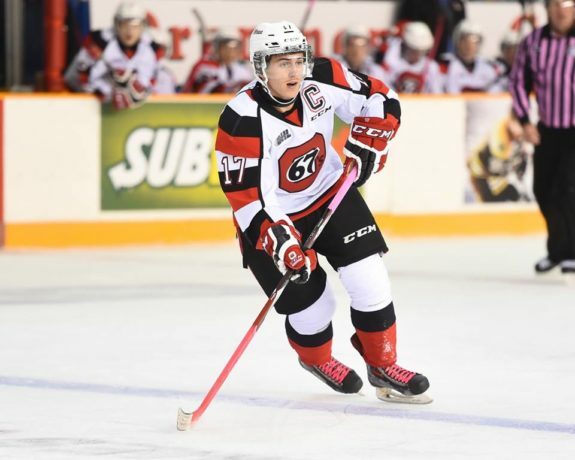 Leader (captain at 17 of the Ottawa 67’s and Team Canada at the 2014 Ivan Hlinka Tournament), difference maker, electrifying skating, hard shot, ability to use his teammates, willing to play physical, willing to play at both ends of the ice. While I have some appreciation for Central Scouting’s ranking as Konecny had a difficult start to the season with a concussion, I feel that this guy has enough high-end qualities to make it to at least the teens come June 2015. Roope is a big guy getting used to his recently increased stature (now 6’4, 185 lbs) while the rest of us are getting used to increased hair flow. Roope has the size, compete, energy, skating ability, passing ability, hockey IQ and face-off skills that make him a second-rounder for sure with a good chance of making it to the first. Not crazy to suggest Roope Hintz is a better prospect than Mikko Rantanen. Roope has looked great this season. I may love shutdown defensemen more than most but this guy continues to impress me – as the only non-Canadian in the top eight of plus-minus at the recent U20’s – not bad for a 17 year-old player on the ninth best team out of ten. Jonas has the size (6’2, 214), skating prowess and defensive acumen to be a top NHL shutdown defenseman – at least 2nd round, maybe late first for me. Matthew Spencer is a guy I liked when I first saw him at the Ivan Hlinka tournament in the summer. Matthew has the size and physical presence on the blueline that is in high demand. Add a hard shot from the point, decent mobility and the ability to get the puck out of the zone with an effective first pass and this guy is going to go at least 2nd round – some have him late first. Radovan’s 6’5, he skates well, he is great on the PK, he is good defensively – what more do you need to know? Though he is unlikely to become a big time scorer but I find it difficult to believe that he will not go 3rd round if not higher with his enormous size and decent skills.